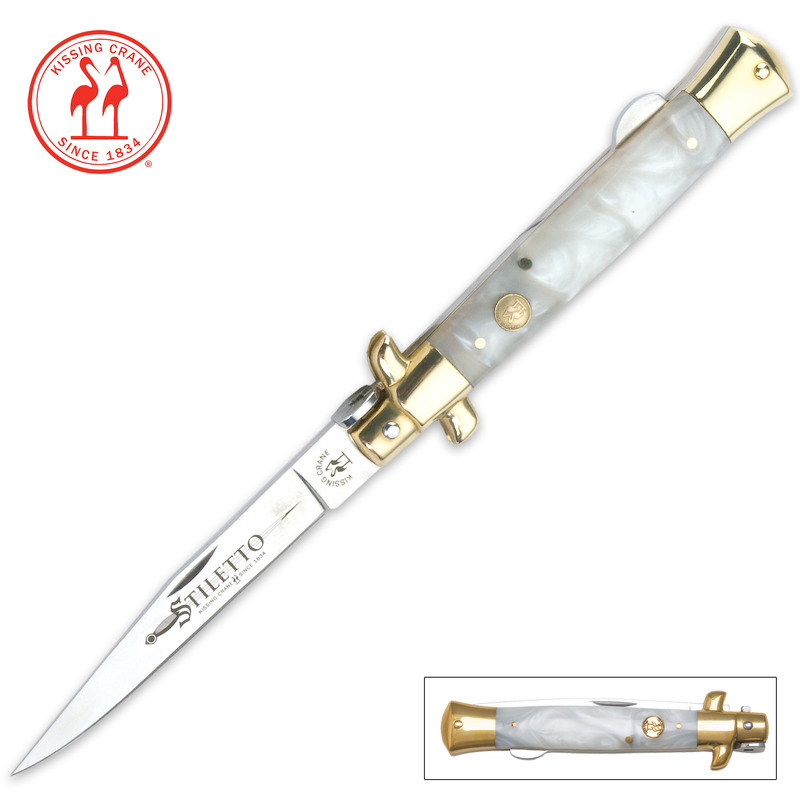 Excellent quality Stiletto knife featuring a mother of pearl handle and brass pins, bolsters and a brass shield on the handle. These Kissing Crane Stiletto knifes are very nice, I own several of them. The only problem I see cropping up in one out of three of each knife, is the Kissing Crane Shield is not set correctly into the handles, they should be flush to the handle, and not protruding outward, and sometimes you can see what a poor job, they did trying to install them, with glue still hanging out of the edges, that wasn't even cleaned after installment. They also are sometimes crooked. I wish someone would contact there quality control department and tighten up on these issues, none the less, I still give them a 5 star rating. I have always loved the stiletto design and this kissing crane is a beautiful example. It is NOT a "switchblade" or "auto assist" knife. Original folding stilettos we're made like this one. The mother of pearl looks to be the real thing. What kissing crane has done here is put a very thin layer of real mother of pearl on first and then cover it with acrylic handle scales. This actually magnifies the beauty of the pearl. The brass bolsters are well made and the blade locks solid and comes very sharp. The only con I have on my example is the kissing crane shield on the handle is a little crooked. Not a big deal to me at all. This thing just feels so good in my hand. Definitely going to order the burnt bone and the black handle stilettos next. 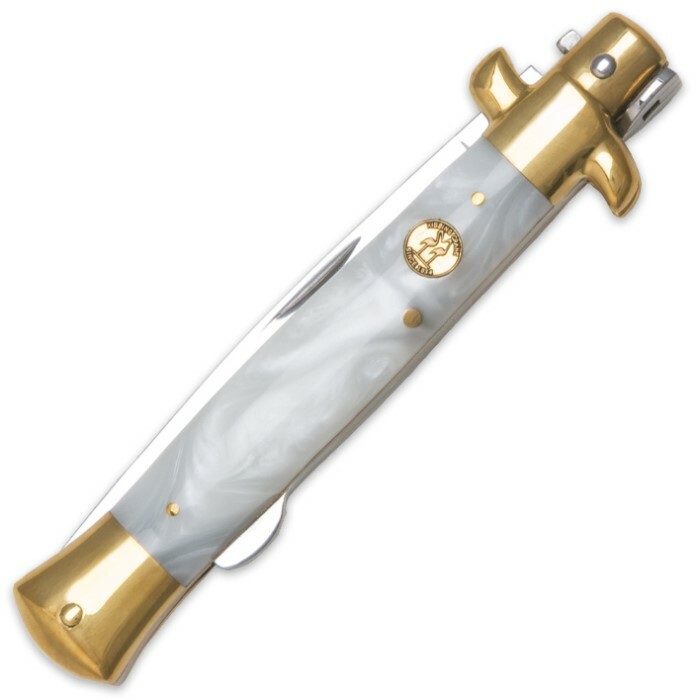 Nice knife but the gold bolsters are really cheesy. Love Kissing Crane knives but it is hard to find one not made in China. Beautiful knife, really worth more then 20.99, shipping was quick and dangerously sharp. Great buy! Do not even second guess buying this knife. It was a great purchase. It is a beautiful knife and is very sharp out of the box. I take this knife with me every where I go. Razor sharp, strong lock, no play at all. Looks completely beautiful, I recommend. Ordered Kissing Crane Mother of Pearl Folding Knife for my husband. He liked it so well that he had me order his two best friends one. Good quality for price. Really nice Stiletto knife. Looks really cool,just like the picture and the blade came pretty sharp. Good price and fast shipping. I was very surprised of the quality and craftsmanship of this knife. I must admit I was skeptical but when I opened the box and examined it for the first time I was very impressed. Truly a knife that could be displayed in any collection.